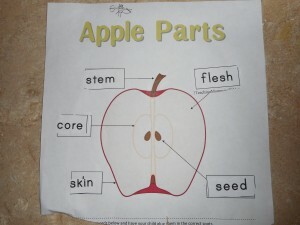 We started our unit with a bare apple tree. 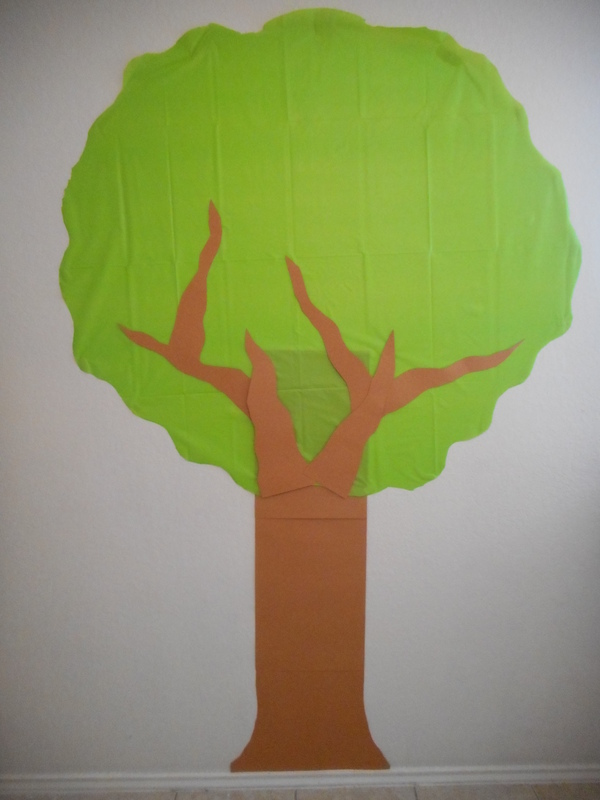 I made the tree out of the trunk from our Chicka Chicka Boom Boom tree and then added the tree part using a cheap, green plastic tablecloth–quick, easy, and cute. Eventually our tree was covered in apples in apples. 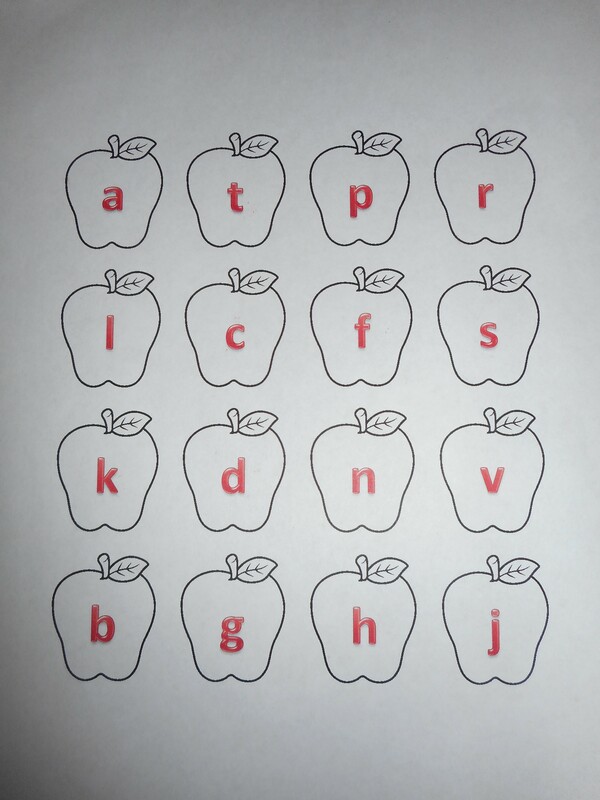 For reviewing letter sounds, we started with another letter hunt since they liked the last one so much! 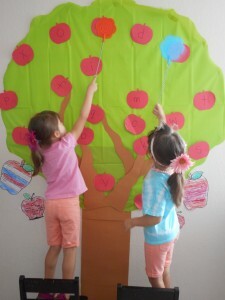 After the letters were up on our tree, we played our Smack the Apple game. I made the letter sounds and then they slapped the lettered apple with our flower fly swatters. In addition to reviewing letter sounds, we also used our apple tree to practice our reading list. I copied our reading lists over to apples and as the girls read each letter they put it up on our tree. 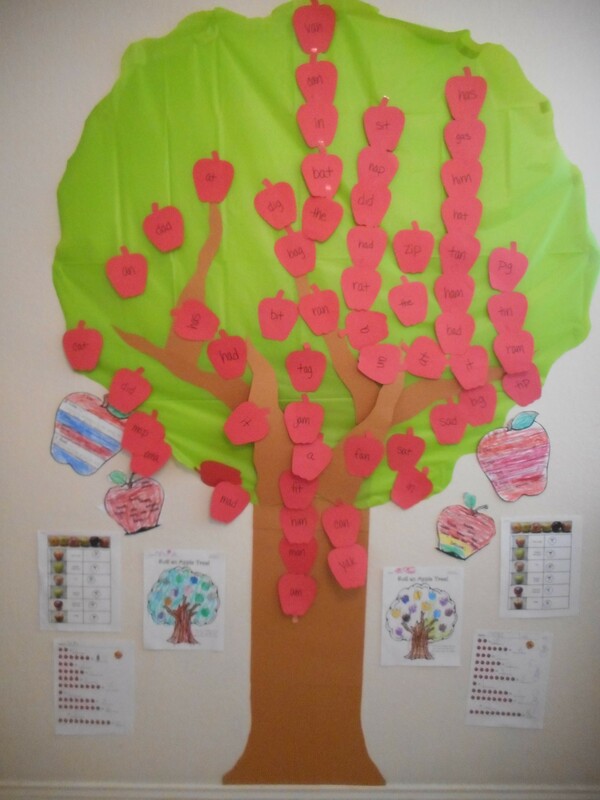 The visual image of so many words on the tree made the girls very proud and allowed them to see how many words they already know. 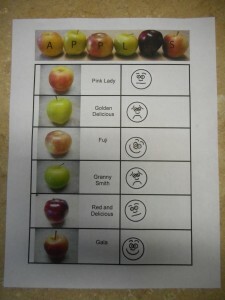 Or course we had to taste apples! We first made a trip to the grocery store where the girls picked out a wide variety of apples. They took turns tasting each apple we had. 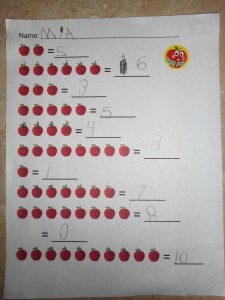 And then they recorded their opinion on their apple worksheet. We used happy, sad, and middle faces to show how they felt. Then we compared everyone’s results to see what we all liked. We used these cute little apples to practice our reading words. On the apple I wrote the vowel from the our three letter words and then on the popsicle stick I wrote to consonants. Just cute slots on either side to feed the stick through. 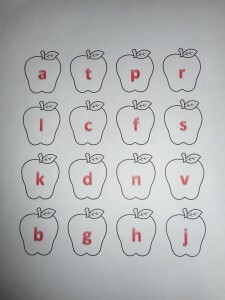 I used the large sticks so it was easier to read the letters and I laminated the apples so that they would hold up better. 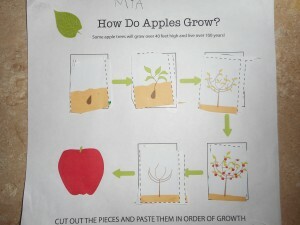 We used this easy science project to introduce the girls to acids and bases. 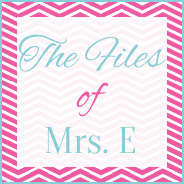 (The best part of this lesson was that my husband taught it all!) After introducing the girls to the concept, they selected some acids and bases around the house for our experiment. We used orange juice and vinegar as our acids while milk of magnesium and oil were our bases. 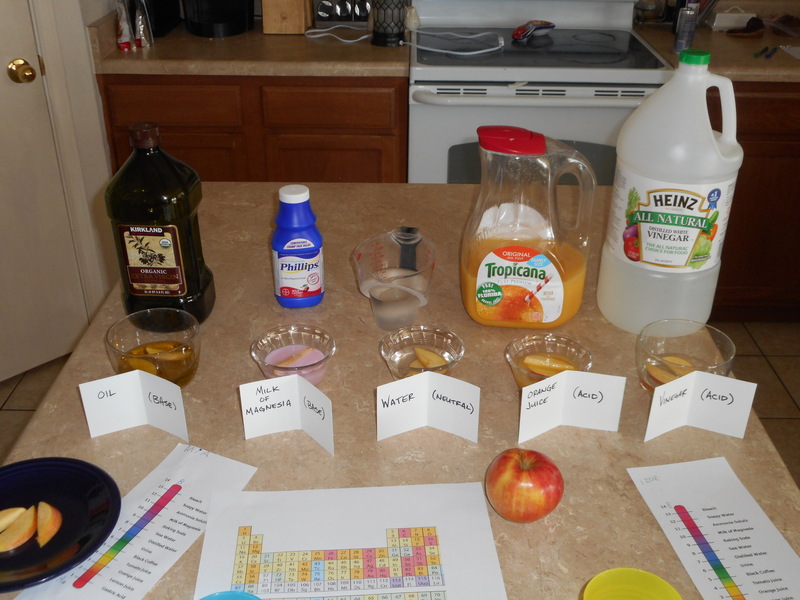 We soaked apple slices in each substance as well as water and watched to see if acids or bases spoiled or preserved the apples better. 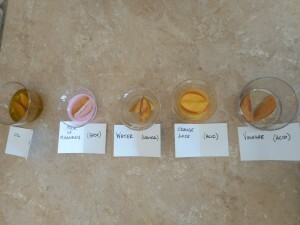 The apple slices browned in every substance except orange juice which caused us to speculate that orange juice has something else in it that helped preserve the apples. We played this as further review of letter recognition. 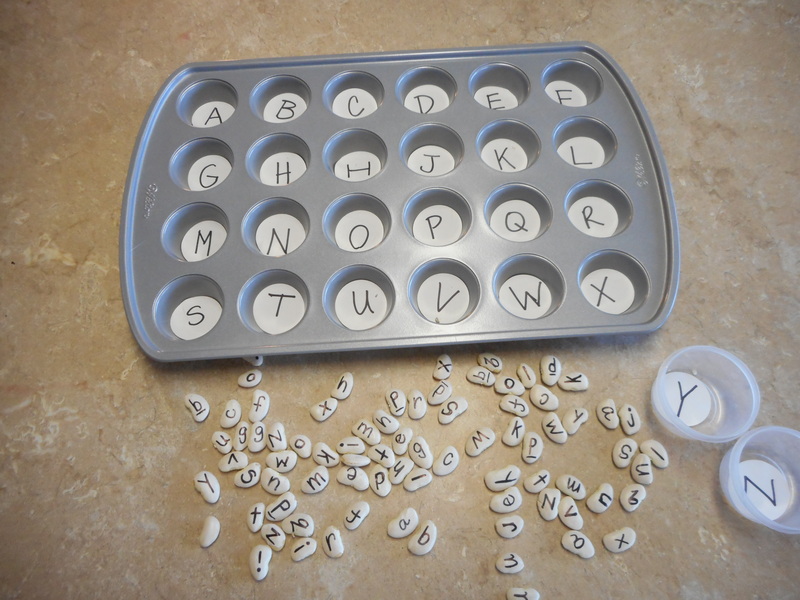 We used large lima beans to be our “seeds” and wrote on each the lower case letters. 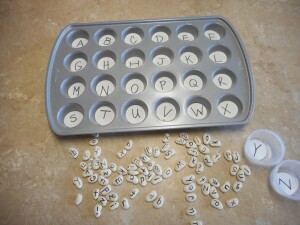 Then we used a mini-muffin pan (with two more little dishes) with capital letters. The girls just matched the seeds to the correct spots in the tin. 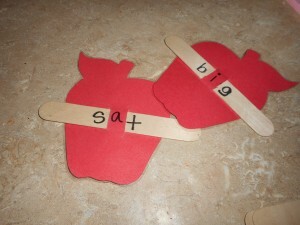 My kiddos LOVE letter bingo. I draw the letters, make the sound, and the girls cover the letter with the M&Ms. When they have four in a row they call bingo and get to eat the M&Ms. 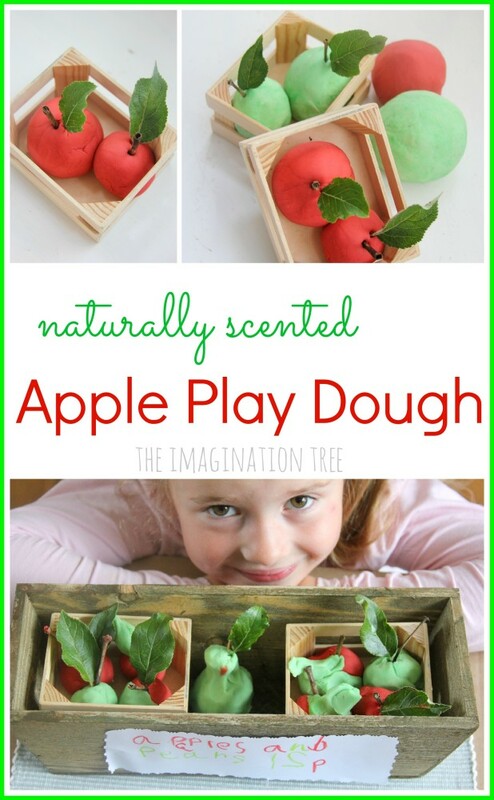 Simple, but fun and yummy. 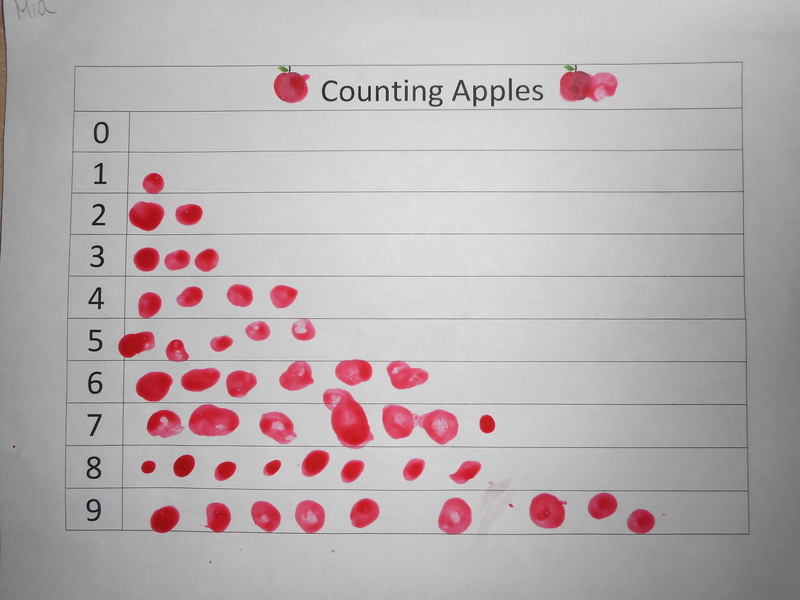 We filled in this worksheet by painting apples with q-tips, just dipping the q-tips and dotting the row with the correct number of apples. The worksheet does go from 0-20. 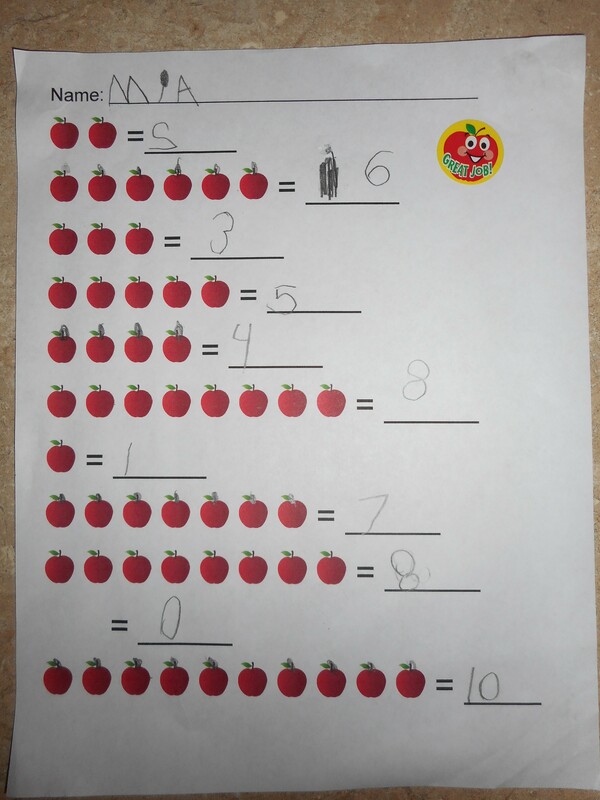 I also made this worksheet for the girls to practice their numbers. 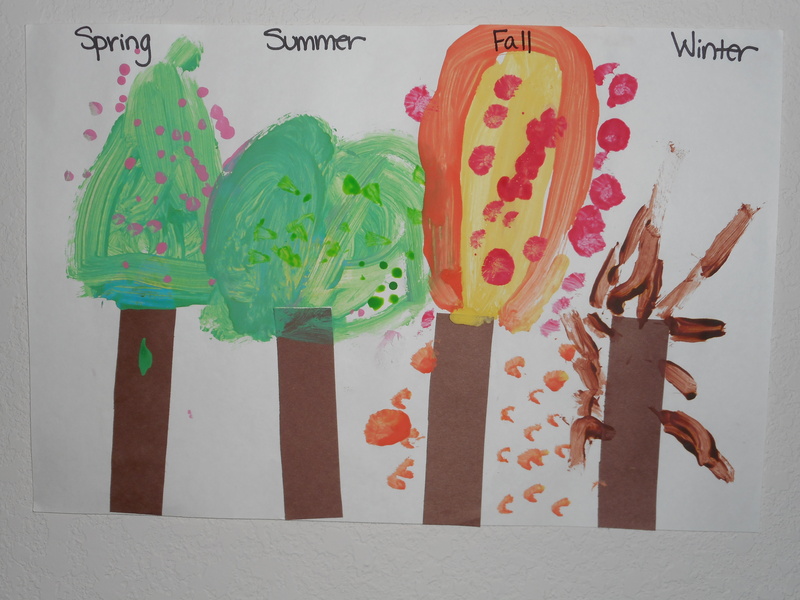 To go with the story Seasons of Arnold’s Apple Tree, we also did this painting activity from Mrs. Vento’s Kindergarten Class. 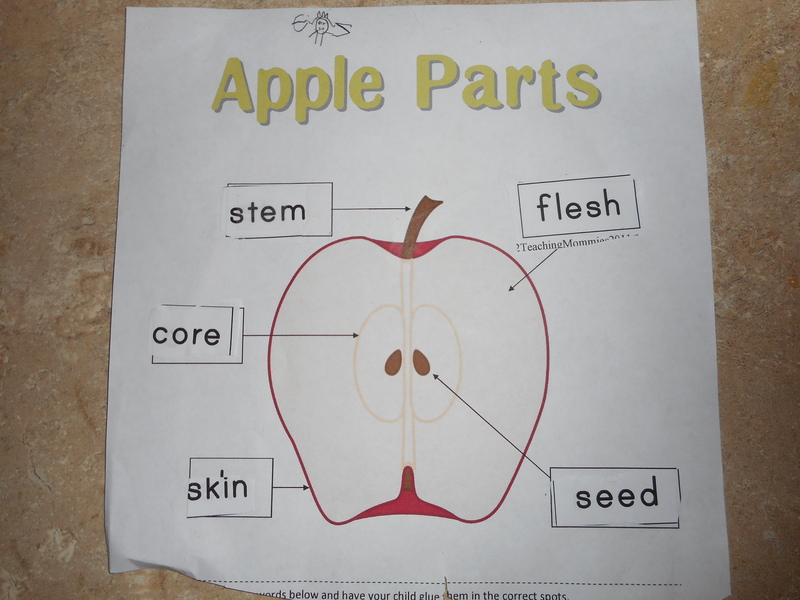 We also looked at the life cycle and different parts of the apple as part of our science curriculum, including these printables. Our cooking activities included apple butter (a favorite in our house) and candied apples. 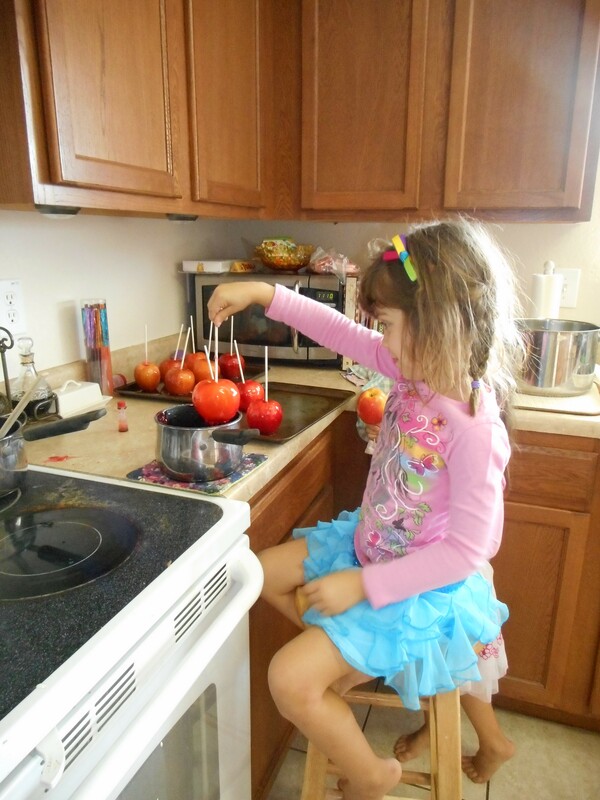 In addition to cooking with each unit, I also try to include a few sensory activities. 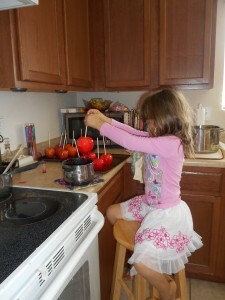 Even though the girls are getting bigger they still love these activities. 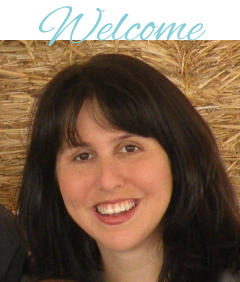 I find that it also helps relax the girls, gives me time to work one on one with each, and allows them to further develop their language and fine motor skills. We played with apple scented homemade playdough. I picked up the recipe from The Imagination Tree, but I had to use apple and cinnamon tea. 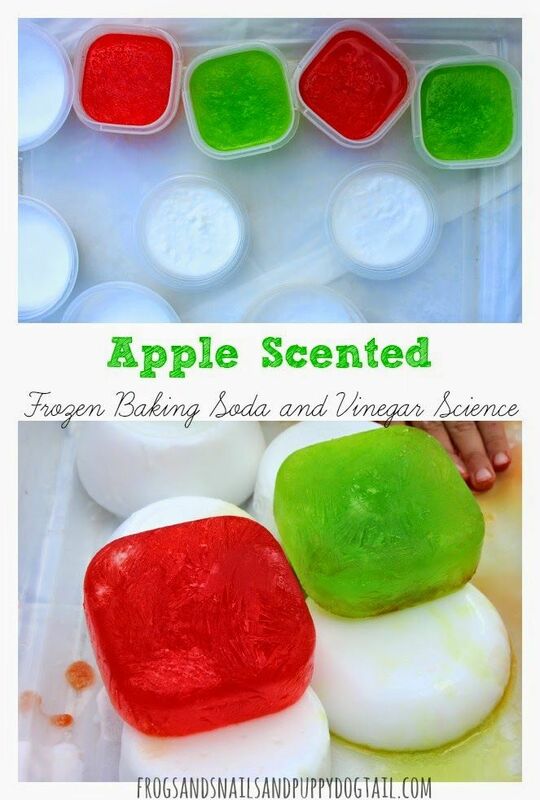 And we did apple scented frozen baking soda and vinegar squares. Since it was still hot here the frozen blocks were very refreshing to play with outside. 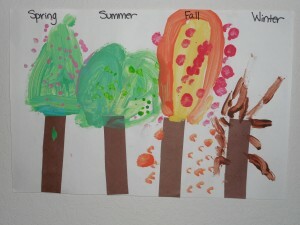 I have even more activities posted on my kindergarten pinterest board.